This Bear and Son folding knife offers a sturdy lock back design for managing your toughest cutting jobs. It has a clip point blade made from high carbon stainless steel with a hollow grind and a satin finish. 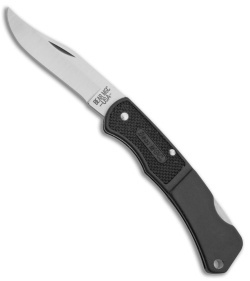 Black Zytel handles provide strength while maintaining a lightweight feel in hand. A perfect knife for EDC use.